According to "Whois Caliberhomeloans.com", Caliberhomeloans is owned by Caliber Home Loans Inc since 2018. Caliberhomeloans was registered with GoDaddy.com LLC on September 24, 2009. 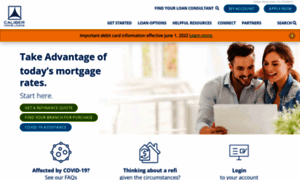 Caliber Home Loans Inc resides in USA and their email is Select Contact Domain Holder link at https://www.godaddy.com/whois/results.aspx?domain=caliberhomeloans.com. Earlier, Caliber Home Loans owners included ******** ******** (see Notes section below on how to view unmasked data) of Caliber Home Loans Inc in 2018, Technology Operations of Caliber Home Loans Inc in 2016 and Inc Caliber Home Loans of Caliber Home Loans Inc later that year and Caliber Home Loans Inc of Caliber Home Loans Inc in 2013 and Vericrest Financial Inc later that year. The current Caliberhomeloans.com owner and other personalities/entities that used to own this domain in the past are listed below. If you would like to share more "whois" details on Caliberhomeloans with us, please contact us! If you are Caliberhomeloans owner and would like to increase privacy protection level for your data - please, deal with GoDaddy.com LLC which is your site’s registrar. Whois history of Caliberhomeloans.com is provided using publicly open domain data.